As the cloud moves from buzzword to mainstream, there are still issues surrounding cloud computing in regards to I/O speed. Not every app, website, or database work well in a standard cloud compute environment. It’s no secret that disk speed has been an issue in cloud hosting environments. Large sites, databases, and other disk critical applications have instead remained on dedicated servers. Quite simply, the slower I/O of most cloud compute platforms brings many databases and I/O intense apps to a crawl. Since the inception of the cloud, limitations of cloud I/O architecture has been a roadblock to I/O heavy applications. The benefits of migration to a cloud compute environment are numerous, and until now, most IT managers charged with managing I/O intense applications have steered clear. Thanks to a relatively new technology, I/O is no longer an issue in a cloud compute environment. That is if your hosting provider has the ‘right’ technology in play. The truth is, 99% of all cloud compute providers simply don’t have the resources to provide a cloud using the right technology. You see, it’s not cheap. Most cloud compute platforms are designed to not care about disk I/O. Mass storage is the name of the game. Most cloud providers tout mass storage as being a big bonus. If all you require is a huge amount of cheap disk space and simple HTML page delivery, these providers are perfect. However, if you care about performance, these are not the providers for you. Fusion-io is a new PCI card that provides incredible I/O performance when meshed with a cloud compute platform such as VMWare. To find out a little more about this perfect cloud compute mix of both hardware and software I sat down with Sagi Brody from Webair.com. Chris (FindMyHost): Good afternoon, Sagi. Can you tell our readers a bit more about the FusionCloud? Sagi (Webair): FusionCloud is a revolutionary cloud computing service designed to provide the fastest possible IOP/s and lowest latency to applications running in the cloud. IOP/s (Input/Output operations per second) is a measure of how quickly programs can read or write data to its storage medium – typically disks. Traditional cloud services are limited in their abilities to provide fast IOP/s performance thus hindering the use of specific applications in the cloud. Examples include busy database clusters, big data analytics, and file servers. Users wanting to move these applications into the cloud are therefore unable to do so or forced to spread the applications between multiple less performing cloud servers which causes considerable operational overhead, complexity, and higher costs. FusionCloud provides more IOP/s and lower latency in a single cloud server than is achievable in most modern physical hardware configurations. This enables users to move those applications into the cloud and provider better performance than they experienced prior with more redundancy and scalability. Chris: This sounds almost too good to be true. Can you elaborate on what the actual Fusion-io PCI card is? I know our readers are techies and would love to hear more. 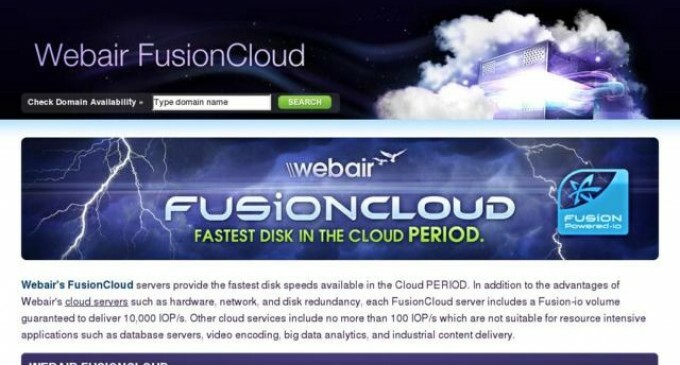 Sagi: Webair’s FusionCloud service is built using the fastest possible solid state disk technology. Specifically, FusionIO PCI-X cards are utilized in our SANs for reads AND writes. FusionIO cards use the same solid state flash memory found on SSD disks. However unlike the SSD disk, they bypass the server’s disk controller which was never meant to operate at such high speeds and now cause bottleneck. Instead they connect directly to the PCI bus unleashing the full potential of the hardware. Even though SSD and FusionIO cards both utilize similar flash memory, a single FusionIO card can deliver performance at least 10-15x that of an SSD disk. Chris: Can you give us some comparisons on the actual speed difference between a traditional cloud platform and the FusionCloud? The readers would be interested in some hard numbers so they can compare. Sagi: Sure – Webair has been able to integrate this technology into its cloud computing platform so that each cloud server is guaranteed at least 10,000 IOP/s in a redundant and scalable way. To compare that to traditional disks, a server with a single SATA disk cannot achieve more than 100 IOP/s. A 10 disk SAS array would yield no more than 1,500 IOP/s. Furthermore – Webair FusionCloud utilizes redundant SANs that can provide these high IOP/s numbers at extremely low latency and in a redundant fashion so that the loss of a physical card or disk would not cause any downtime or degradation of service for the users. Chris: Pretty amazing. What kind of disk storage and replication options are available to FusionCloud customers? Sagi: The configurations are highly customizable. Users can mix and match storage tiers to applications within their cloud servers so that the correct technology is utilized for each use case. Therefore, they only need to purchase enough FusionCloud storage for their high IOP/s uses and can utilize our SAN storage or cloud storage for the their other needs. Each of these storage tiers is redundant by default, includes built in snapshots, and offers multiple options for off site or global replication. Dedicated servers are more difficult and more expensive to maintain than a cloud environment. Many have been hesitant on moving I/O heavy applications and platforms to the cloud due to slow performing disk speed. Webair’s FusionCloud solves the problem traditional cloud platforms face concerning slow performance through creative use of hardware and software. Webair provides IT directors the best the cloud has to offer mixed with state-of-the-art disk speed to form the perfect cocktail of performance and reliability. Atlantic.Net Offers Up to 50% Off on All Cloud Server Hosting Plans!